Communities of Faith is a collection of essays on the multicultural Christian spirit and practices of churches around the world, with particular attention to Africa and the African diaspora. The essays span history, theology, anthropology, ecumenism, and missiology. Readers will be treated to fresh perspectives on African Pentecostal higher education, Pentecostalism and witchcraft in East Africa, Methodist camp meetings in Ghana, Ghanaian diaspora missions in Europe and North America, gender roles in South African Christian communities, HIV/AIDS ministries in Uganda, Japanese funerary rites, enculturation and contextualization principles of mission, and many other aspects of the Christian world mission. With essays from well-known scholars as well as young and emerging men and women in academia, Communities of Faith illuminates current realities of world Christianity and contributes to the scholarship of today's worldwide Christian witness. "The great assumption of this volume is that Africans, either residing on that great continent or in diaspora around the world, are now the vibrant new voices of a robust Christian faith which has finally left behind the swaddling clothes of Christendom and found the strength and vigor of its own voice. This volume is a masterful introduction to these new voices precisely because of its diversity. Here we find theological, contextual, anthropological, and missiological reflections . . . revealing how nuanced and textured the African contribution to world Christianity has already become. I can think of no greater tribute to Tite Tienou than these essays written by his students and friends." 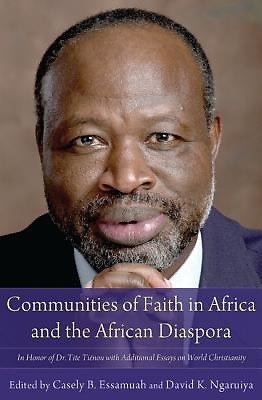 --Timothy C. Tennent, Asbury Theological Seminary "This brilliant volume of twenty-five essays on many aspects of global Christianity, with special attention to Africa and the African diaspora, is a worthy tribute to one of our most distinguished missiologists, Tite Tienou, whose career has spanned three continents." --Gerald H. Anderson, Overseas Ministries Study Center J. Kwabena Asamoah-Gyadu Paul Kwabena Boafo Elias K. Bongmba Casely B. Essamuah Paul Kollman David K. Ngaruiya Caleb O. Oladipo Steven D. H. Rasmussen Dana L. Robert Kenneth R. Ross Stephen Strauss Angela M. Wakhweya Emma Wild-Wood Miriam Adeney Stephen B. Bevans, SVD Jonathan J. Bonk William R. Burrows How Chuang Chua J. Nelson Jennings Robert J. Priest Cathy Ross Mark Shaw Andrew F. Walls Allen Yeh Casely B. Essamuah, ThD, is Global Missions Pastor at Bay Area Community Church in Annapolis, Maryland. He is the author of Genuinely Ghanaian: A History of the Methodist Church, Ghana, 1961-2000 (2010). David K. Ngaruiya, PhD, is Associate Professor of Intercultural Studies and Deputy Vice Chancellor: Finance, Administration, and Planning at the International Leadership University, Nairobi, Kenya."